Food Truck Fridays in the Big D…. For a metropolitan city, one would argue that Dallas is not so …. city. WAIT. Before you judge, yes we have museums, an opera house, every restaurant chain on the planet, major traffic, shopping as far as the eye can see, etc. All the things that come to mind when you think of a city. But we lack one thing most big cities have, pedestrians. Pedestrian traffic creates the need for fun local shops or great little, well-priced eateries within walking distance. Pedestrian traffic also creates meals on wheels. You can’t come to me, I’ll come to you. Enter Food Trucks. 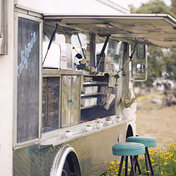 Food Trucks have become more popular across the country. From what little I know, they’ve always been popular in LA and NYC, but then you get a show like The Great Food Truck Race and suddenly it’s catching on in cities that are er, not so city. So it’s not your typical food on wheels, it’s gourmet food on wheels. It’s for everyone, and it’s definitely for foodies. What about a Bahn Mi – a 12″ Baguette served with garlic mayonaise, cucumbers, pickled daikons and carrots, jalapenos, cilantro & bbq pork, and if you’re feeling lucky top it with a fried egg. Or what about some Kimchee Fries – think Korean chili fries. How about a goat cheese, bacon, and strawberry jam slider? Salivating. Delicious food on wheels? Count me in. ***Thanks to sittinginatree for the amazing Food Truck Wedding Photo. If I had to do it over again, I would totally do a food truck wedding. TOTALLY. This entry was posted in My Favorite Things and tagged Bahn Mi, Dallas, Food Truck, Friday, Shops at Park Lane, Sliders. Bookmark the permalink. the onlybad thing about Food Truck Fridays is that there are not enought trucks or help to feed the hungry hordes of people… the marketing is way ahead of operations on this one… there seems to be big demand to support this, but not enough trucks! we should totally start a food truck…I’m picturing two caricatures with warby parker glasses on the side of the truck….